Not all of us always have the time to properly wash and scrub infusers after every brewing, and sometimes we even leave the tea leaves in the infuser for a second and third brewing. That’s when tea stains start creating and a brown crust starts covering the once new and shiny tool. Of course you can scrub it with a sponge and water or detergent, but that usually takes a long time and is kind of tedious. To be honest, it’s not possible to completely avoid the tediousness of it, but you can save time on using other solutions. I found that the best way to clean them was to use an old toothbrush and baking soda. You can put the brush under water and then dip it in the baking soda which creates a paste. The crust and stains come off easier because of the small brush bristles, and you can even polish the metal net until it’s shiny again. Thanks to the toothbrush you can access and part of the infuser without a problem. Optionally you can try to put the infused into a mixture of water and baking soda overnight, but usually anything that’s soaked in water is bound to be easier to clean. Place 1 tablespoon of Baking Soda into cup. Add 2 tablespoons White Vinegar. Let the mix fiz and use a kitchen cloth or scrub brush to cover inside of the mug with mix. Let the cleaning solution soak in the mug for 10 minutes. Rub inside of cup with a scrubbing brush or kitchen cloth. If mineral deposits affect the entire inside area of the kettle, a good steam cleaning may resolve the problem. Pour 1 part apple cider vinegar and 4 parts water in the kettle — enough to fill it with an inch or 2 of total liquid. Heat the kettle and allow it to create steam for several minutes — boiling isn’t necessary. If the whistling is a bit too much to handle, turn down the heat so the kettle still creates steam while making little noise. Swirl the kettle around; then allow the liquid to cool to room temperature. Dip a dishcloth into the liquid, then sprinkle baking soda onto the dishcloth. Dump the liquid down the drain and use the soda and dishcloth to wipe away any remaining residue. Rinse the kettle thoroughly. 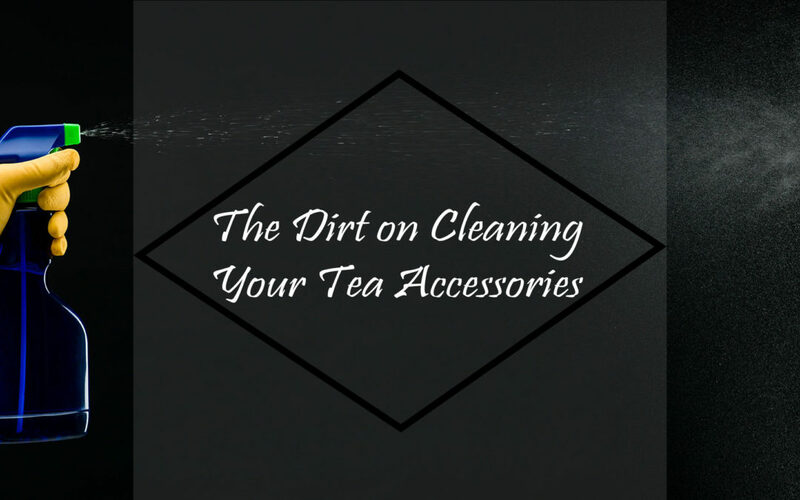 If you have any further questions about cleaning your tea accessories, feel free to ask one of our knowledgeable “Tea-Ristas” in the shop or by contacting us online.